I have been suicidal three times in my life. The first instance was after my dad took his life. In 2002, at the age of 50, my dad was paralyzed in a hunting accident. My dad was building a tree stand when the branch broke underneath of him and in an instant, he fell two stories straight to the ground. Not far from retirement, my dad felt robbed out of life, became very depressed, and eventually developed a serious gambling addiction which led to my mom leaving my dad in May of 2007. Seven weeks later he took his own life. At the time I was completely numb to everything that was going on in my life, so it wasn’t until the summer of 2008 when I experienced suicidal thoughts myself. I was dealing with a Percocet addiction (which at the time I didn’t realize what that was) and I had a knife on my chest when I felt like life wasn’t worth living anymore. The thoughts running through my head were “Dad did it, so you can too. Nobody will blame you if you decided to take your life as well. Go ahead, do it!”. I never hurt myself in that moment because there was a small voice inside my head that said, “I don’t want THAT to be the ending to my story. You don’t have to be like your dad!”. The second time I wanted to take my own life was in the summer of 2014, after the Sochi Paralympics. I had allowed myself to take a downward spiral after the games, and by mid-summer, about four months after the Games, I found myself in the emergency psychiatric ward in St. Josephs Hospital in Hamilton, Ontario. I waited for two hours with my mom and Grandma to see the emergency psych doc, however in approximately a 15 minute window I felt like I snapped out of my depression. As we sat in our third waiting room, there was another set of parents with their son. He had about 15 fresh razor blade cuts all over both of his forearms. He kept rocking back and forth in his chair as the parents just sat there with blank looks on their faces. We all moved in to our rooms (which were side by side) to see our doctors, and it was only a few minutes before all hell broke loose. “F**k you!! You told me I wouldn’t have to speak about this!!”. Within seconds the teenage boy had started screaming and kicked the door open to the hallway. Through the glass window of my door, I saw him punch the hand sanitizer off the wall as security was quickly called to calm the situation. In that moment was my wake up call as I said to myself “I have to get better so I can help this guy. I am not as bad as him, and people like him need my help.”. That moment really shook me up, and was truly the catalyst to turning things around for the second time. Now, let’s take a look at scenario number three which happened in January 2016. I continued to play sledge hockey for one more year throughout the 2014–2015 season, until I was cut from the team at the beginning of the 2015–2016 season. I knew I wasn’t happy being there. I struggled with questions like “Why am I here? I don’t want to play any longer, but I should… so why not?”. There were similar thoughts from the Post Olympic crash such as “Now what? You’ve done everything you wanted to in life. You do want to have a family, but that’s not a ‘goal’. What else is there to live for?”, and I was too chicken to start my own business which was a dream I actually yearned for. Visit https://www.mygameplan.ca for more information on Canada’s Total Athlete Wellness Program. After emailing for an appointment, they quickly got me in for treatment and sent me to see a sport psychiatrist. While with my psychiatrist, I had some really bad days. Just like those moments you see in a movie where you see someone curled up on the chair sideways with both their legs hanging over the arm of the chair, rocking back and forth crying. That was me. 1. My relationship with my girlfriend was ending. We were both hanging on because we wanted it to work but splitting up was truly the best thing for us. Sometimes the best thing you can do is let go. 2. I could go get a corporate job with my experience and credentials but knew that I could not breathe working for someone else. 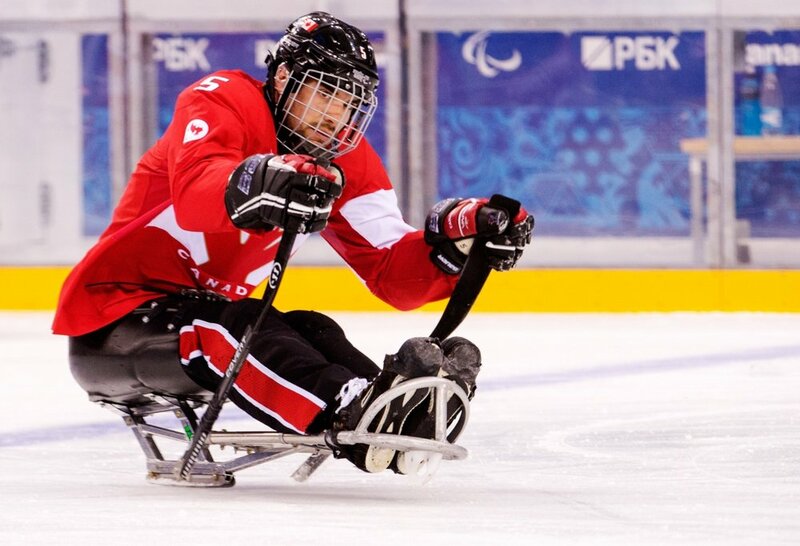 I had to take the leap and go after what I really wanted, creating The Sledge Hockey Experience. 3. I knew I had to complete writing my autobiography but had been sitting on it for months. It was time to step up and finish it. After receiving a prescription for antidepressants, I was home at my condo, three days in to taking my prescription, when I was on the balcony and started thinking about jumping off. The same nasty thoughts as before were going through my head such as “Do it! You can do this. Nobody would blame you. You’re here today, forgotten tomorrow. Just do it!”. “This is not me. I don’t do these things. I know that I have experienced a normal, positive, happy life before and I was not born depressed. I don’t want to get myself on antidepressants only to try and commit to problem solving for the next several months to see what might work, when they’re there as a tool to help me get back to my normal self. Plus, I will have to wean myself on them and off of them. I committed in that moment that I would try everything that is possible to continue to write a new ending to my story and let this chapter in my life pass. It was time to let go of who I thought I was and move forward. I share this with you because these were the exact words that I would say to myself when I was in those depressed states. I do not wish that you or I have to hit rock bottom to get to these moments of decision, but from these experiences I learned not only how valuable it is to live, but also how to turn things around. As we begin the new year, Bell Let’s Talk Day is just around the corner on January 30th. There are many people who have suffered throughout the holidays in silence, and for those who have risen above their challenges, by speaking up, you empower others to do the same. I encourage you to share your experiences with mental illness, and if you are suffering in silence, know that this is not the end. Choose to stay in the fight.